In this article I will explain the different kinds of Dentoalveolar trauma. And I will demonstrate the crown fractures either the complicated and non complicated fractures or how to manage them in the dental office. Then I will demonstrate the different kinds of root fractures either horizontal or vertical and how to manage these cases in the dental office. After that I will demonstrate the different cases of avulsion of the teeth and how to manage them. Finally I will attach a table of the biological consequence of the Dentoalveolar trauma and the different type of splinting. People usually suffer many accidents that in their daily day-to-day life. Whether they are adults or children, causing injuries in their teeth or tissues that support them, which leads to teeth or bone fractures. Here we overlook over the injuries that affect the teeth and how to diagnose and treat them. Table 1: Dentoalveolar trauma . 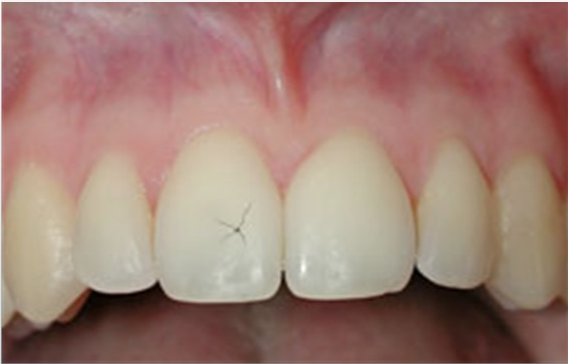 A.	Uncomplicated fractures: In the uncomplicated fractures there is no pulp involvement, and is divided into infraction (Figure 1); which is an incomplete crack of the enamel without loss of tooth structure. 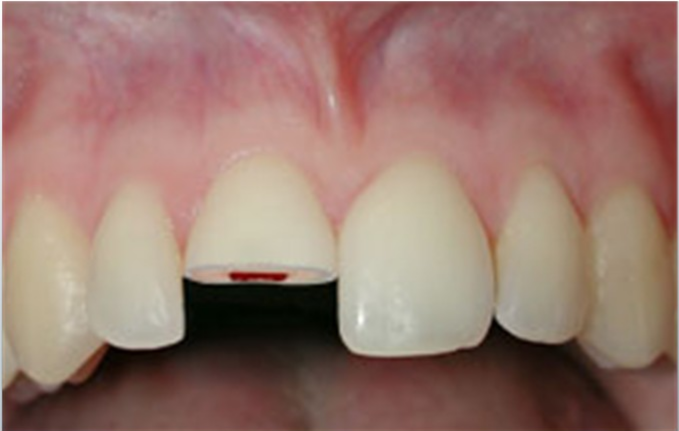 The second division is the enamel fracture; which is known as Ellis Class I (Figure 2) and involves the enamel only. 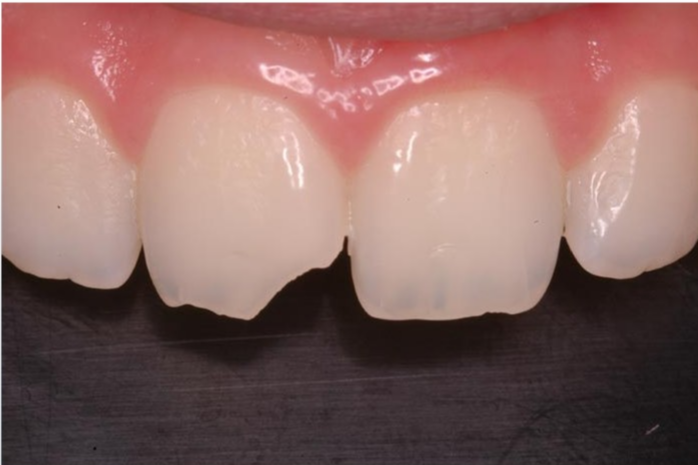 This type of enamel fracture is treated by grinding or smoothing the rough edges or restoring the lost structure as it has a good prognosis. 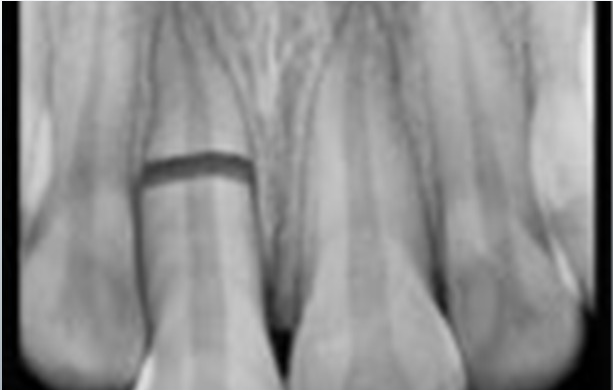 The third division of uncomplicated fractures is the crown fracture without pulp involvement; which is known as Ellis Class II (Figure 3) & involving enamel & dentin only. This type is managed by a bonded resin restoration or by crowning it, and its prognosis is good unless accompanied by a luxation injury. Figure 2: Ellis Class I. Figure 3: Ellis Class II. B. 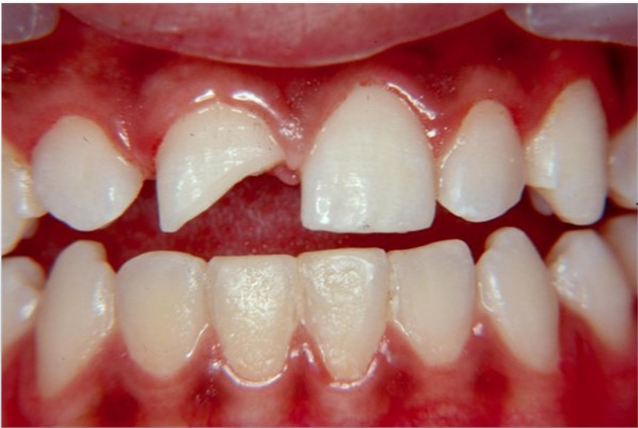 Complicated fractures: On the other hand there is the Complicated Fractures which are the fractures of the crown that involves enamel, dentin & the pulp, also known as Ellis Class III (Figure 4) and the fracture of the root. a. The stage of development of the tooth: In an immature tooth, vital pulp therapy should be attempted because of the tremendous advantages of maintaining the vitality of the pulp. b. Time between the accident and treatment: In the 24 hours after a traumatic injury, the initial reaction of the pulp is proliferative with no more than 2 mm of pulp inflammation. After 24 hours, chances of direct bacterial contamination increases. c.	Concomitant periodontal injury: A periodontal injury compromises the nutritional supply of the pulp. d.	The Restorative Treatment plan: If more complex restoration is to be placed, a full RCT is recommended. Figure 4: Ellis Class III. 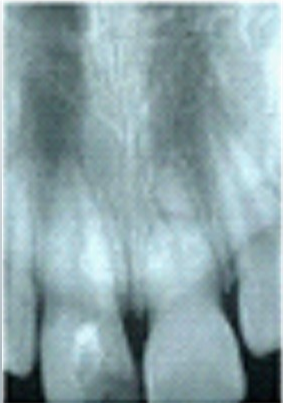 Figure 5: Root fracture (Coronal Third). In the root fractures, which involve cementum, dentin & pulp. It could be horizontal or vertical. In the horizontal root fracture which may show bleeding from the sulcus, the coronal segment is displaced, but generally the apical segment is not displaced. The chance of pulp necrosis is about 25% may result from displacement, but in the apical segment is rare due to the apical pulp circulation is not disrupted. Radiographic diagnosis is made by one occlusal film and three preiapical films (one at 0 degree, then one each at + and - 15 degrees from the vertical axis of the tooth). a.	Healing with calcified tissue: The ideal healing is calcific healing. A calcific callus is formed at the fracture site on the root surface and inside the canal wall. 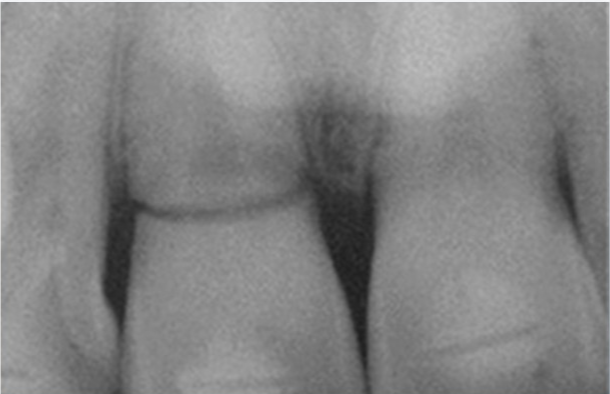 b.	Healing with interproximal connective tissue. c.	Healing with bone & connective tissue. d.	Interproximal inflammatory tissue without healing. With root fractures that have maintained the vitality of the pulp, the main goal of treatment is to enhance the healing process. Prognosis increases with quick treatment, close reduction of the root segments, and splinting. When the fracture is in the level of or coronal to the crest of the alveolar bone (Figure 5), the prognosis is poor. This case is managed by stabilizing the coronal fragment with rigid splint for 2 to 4 months. 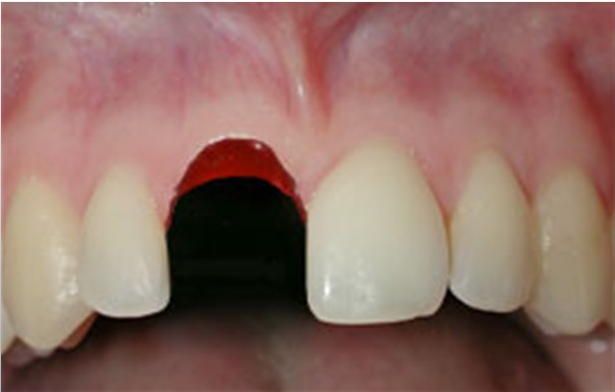 If reattachment of the fractured segments is not possible, extraction of the coronal segment is indicated. When the fracture in the midroot (Figure 6), non rigid splinting for 2 to 4 weeks is the treatment of choice. The probability of pulp necrosis is for the most part is limited to the coronal segment. The pulp lumen is wide at the apical extent of the coronal segment so that the apexification may be indicated. In rare cases when both coronal and apical pulps are necrotic, full RCT through the fracture is difficult, and the necrotic apical segments may be removed surgically. And when the fracture is in the apical part (Figure 7) of the root, the pulp will mostly be vital and the tooth will have little or no mobility .It has the best prognosis. Figure 6: Root fracture (Middle Third). Figure 7: Root fracture (Apical Third). 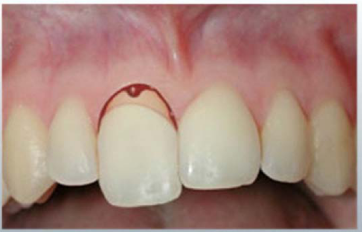 The vertical root fracture starts apically & progresses coronaly, and usually is in the buccal-lingual plane of roots. In most cases, there is an isolated probing defect at the site of the fracture. There is an important diagnostic sign which is a radiolucency from the apical region to the middle of the root (J-shaped or teardrop-shaped). It may be accompanied by other entitles such as a periodontal disease or failed root canal treatment. a. Heavy enlargement of the canal when doing the filing mechanical cleaning. a. Extraction if it is single rooted tooth. b.	Hemisectioning or extraction if it is a multi-rooted tooth. This case is the worst case of the fractures of the roots. Also known as “Luxation” which is the effect that ends to dislocate the tooth from the alveolus, which known as (Ellis Class V). a.	Concussion: No displacement of the tooth, Normal mobility test, Sensitive to percussion. Pulp blood supply is likely to recover. We must perform EPT vitality tests & radiographs and occlusal adjustment to manage this case. b.	Subluxation (Figure 8): Which the tooth is loosened but not displaced. We can manage this case the same of concussion in addition of a non-rigid splinting from 2-4 weeks if mobile. Pulpal healing abilities in the (Table 2). Table 2: All information taken from International Association of Dental Traumatology . c.	Extrusive or Lateral luxation (Figure 9): Which the tooth is partially extruded from its socket. May accompanies by alveolar fracture. But the Lateral luxation is the displacement of the crown palatally and the root apex labially. d.	We can manage this case by taking radiographs (PA - OPG - Occlusal), and repositioning of the tooth, and non rigid splinting for 2-4 weeks. We must do RCT if necessary if its closed apex, or observation for open apex. Pulpal healing outcomes (Table 2). e.	Intrusive luxation (Figure 10): This is apical displacement of the tooth. We can manage this case if it has an open apex to monitor and allow to re-eruption. If it has a closed apex we will try to reposition the teeth orthodontically, surgical repositioning and endodontic treatment. Pulpal outcomes in (Table 2). f.	Avulsion (exarticulation) (Figure 11): It is the complete separation of a tooth from its alveolus by traumatic injury (Ellis class VI). When we manage this case, the first priority is to protect the viability of the periodontal ligament. a)	Reimplant immediately, if possible. Immediate replantation will improve PDL damage and then healing process starts so that prevents the unfavorable root resorption. •	Don’t handle the root surface & don’t curette the socket. •	Remove coagulum from socket with saline and examine the alveolar socket. •	Replant slowly with slight digital pressure. •	Stabilize with a semi-rigid splint for 7 to 10 days. •	Administer any systemic antibiotic (Penicillin 250mg 4x per day for 7 days or doxycycline 100mg 2x per day for 7 days), refer to the drugs reference to know the appropriate dose according to patient age and weight. •	Refer to physician to evaluate need for tetanus booster. •	After the 10th day we will do RCT , if RCT was delayed & signs of resorption revealed, a long term treatment with calcium hydroxide is given before a compete RCT. •	Remove debris & necrotic periodontal ligament. •	Remove coagulum from the socket with saline and examine the alveolar socket. •	Immerse the tooth in 2.4% Sodium Fluoride -5.5 PH for 5 minutes. Replant slowly with a semi-rigid splint for 7 to 10 days. •	Administer systemic antibiotic as previously. •	Refer to physician for tetanus booster. •	RCT treatment is the same for <60 minutes. •	If contaminated, clean the root surface & apical foramen with a stream of saline. •	Remove coagulum from socket with saline and examine alveolar socket. •	We usually monitor this case and not do an endodontic treatment unless a pulpal inflammation was revealed, we will do an apexification. Replantation usually is not indicated. If we will replant it, try to do RCT outside the mouth or apexification inside the mouth. According to the current guidelines and within the limits of an in vitro study, it can be stated that flexible or semi rigid splints such as the titanium trauma splint and wire-composite splints 1 and 2 are appropriate for splinting teeth with dislocation injuries and root fractures, whereas rigid splints such as wire-composite splint 3 and the titanium ring splint can be used to treat alveolar process fractures (Figure 12). 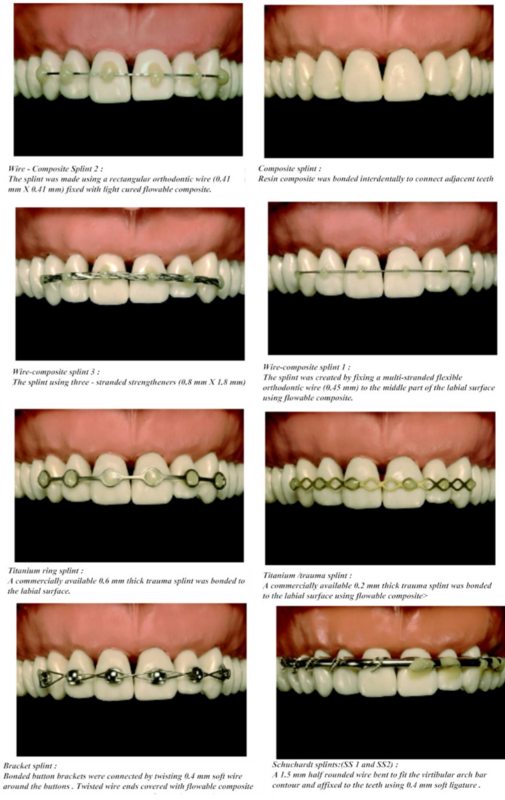 Figure 12: Types of splints. From this learning article we have shown some important points that we must put in our consideration. We must try to conserve the vitality of the pulp whenever possible. The horizontal root fractures in the cervical region are the worst types of horizontal root fractures and require more time to heal and have the worst prognosis. The vertical root fractures are the worst type of all fractures of the root, which have the worst prognosis & require extraction of the root or amputation of multi-rooted tooth. The open apex cases have better prognosis than closed apex cases. In avulsion cases, time factor is from the most important factors to success, which must be less than 30 minutes of extra oral time to have the success rate of 50% and more. Andersson L, Kahnberg K-E, Pogrel MA (2010) Oral & Maxillofacial Surgery. (4th edn), Wiley-Blackwell Publishing, UK.